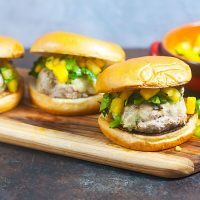 Jerk Turkey Burgers with Pineapple Salsa | Healthy. Delicious. 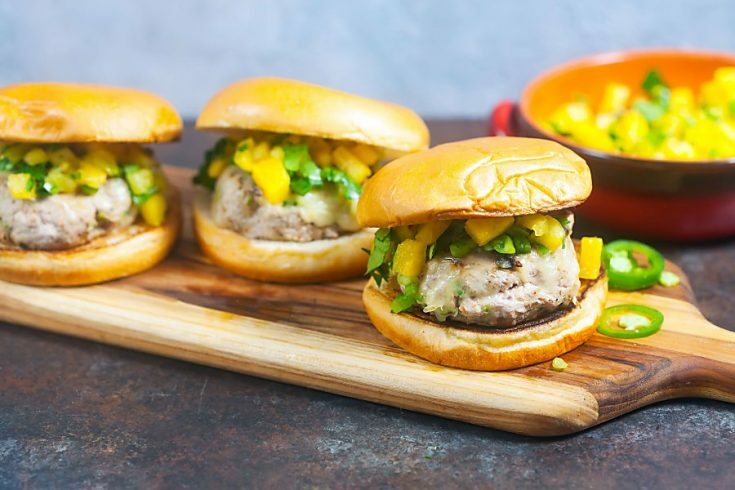 Juicy jerk turkey burgers have shredded zucchini tucked inside. They’re topped off with fresh pineapple salsa for a tropical flavor explosion! When I was invited to participate in Burger Month 2017, I obviously couldn’t say no. 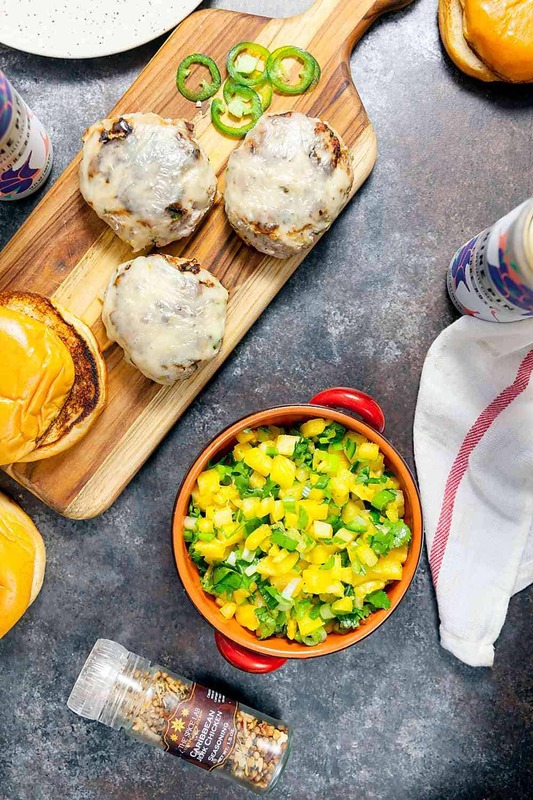 What better way to celebrate my love of one of summer’s favorite foods than to share a new burger recipe just in time for your Memorial Day cookout? Deciding to participate was easy, but figuring out what to make what much more difficult. Burger Month is all about celebrating epic, over the top burgers, but I also wanted to keep my contribution in line with my healthy, fresh point of view. 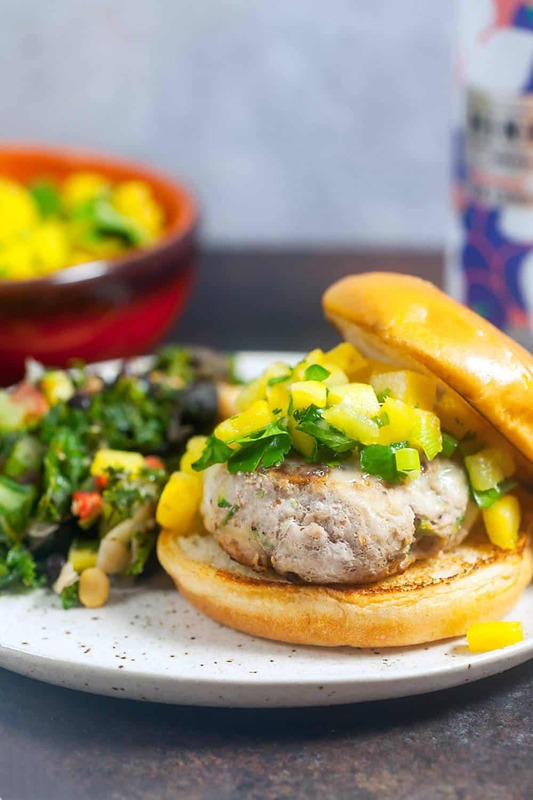 After a ton of brainstorming, I finally settled on this jerk turkey burger with pineapple salsa. They’re chock full of flavor without being heavy or greasy, and they won’t make you feel like you’re in a food coma. 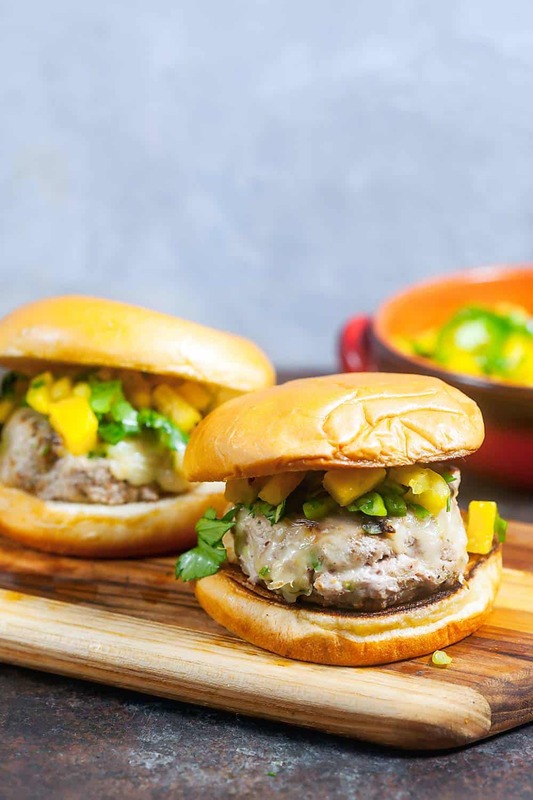 These jerk turkey burgers use my favorite trick to lightening up burgers – mixing shredded zucchini into the meat. Zucchini has a neutral flavor that’s barely noticeable, but it adds bulk and moisture to your patty to you can use leaner meat – and less of it! I’ve also used this technique in my turkey burgers with dill havarti and my beef and zucchini burgers. Along with the zucchini, I mixed in jerk seasoning and a generous pinch of salt to give the burgers tons of flavor. Form the meat into patties and grill until just cooked through, then top them with cheese. Traditional cheddar works, but I like to spice things up even more with jalapeño cheddar or pepper jack. 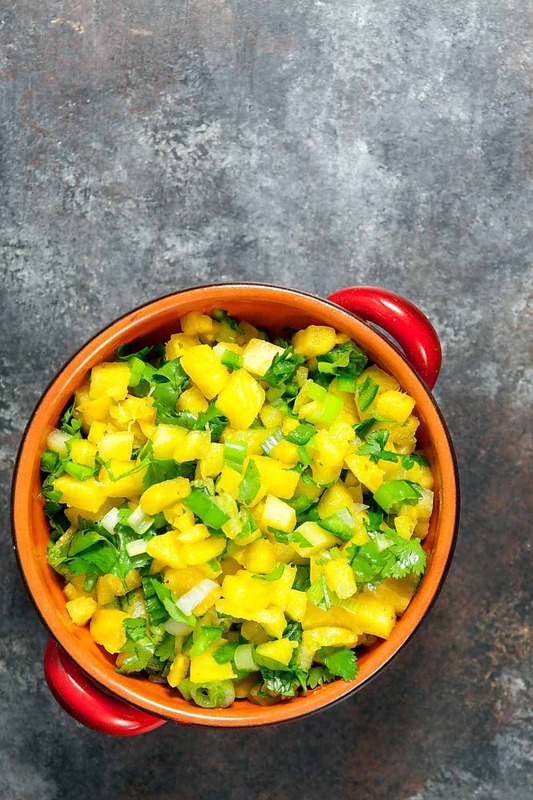 While the burgers cook, make the pineapple salsa. This is the most exciting part of this recipe, and it’s really easy. Just mix together finely diced pineapple with green onions, jalapeños, cilantro, and lime juice. When I first started making this salsa, I always used red onion, but lately I’ve switched to scallions, which have a much milder flavor and don’t have the same sharp onion bite. Since scallions are a major component of jerk sauce, they feel right at home on these burgers. Top the burgers with the salsa, and serve them on toasted buns. Any leftover salsa you have is delicious scooped up with tortilla chips. In a mixing bowl, combine the turkey and zucchini. Season with jerk seasoning and a generous pinch of salt. Mix gently to combine to ingredients without overworking the meat. Form into 4 patties. Grill the burgers over medium-high heat, turning at least once, for 10-12 minutes or until cooked through. Top with cheese. Cover and cook 30 seconds to 1 minute to melt. While the burgers cook, prepare the salsa. In a second bowl, combine the pineapple, scallions, cilantro, jalapeño, and lime juice. Mix well and season to taste with salt. Top the burgers with the salsa and serve on toasted rolls. I teamed up with 100 other food bloggers to celebrate Burger Month by bringing you 100 epic new burger recipes – you’re sure to find a few new favorites! I’d like to pass along my thanks to our sponsors for offering some excellent prizes to help celebrate. 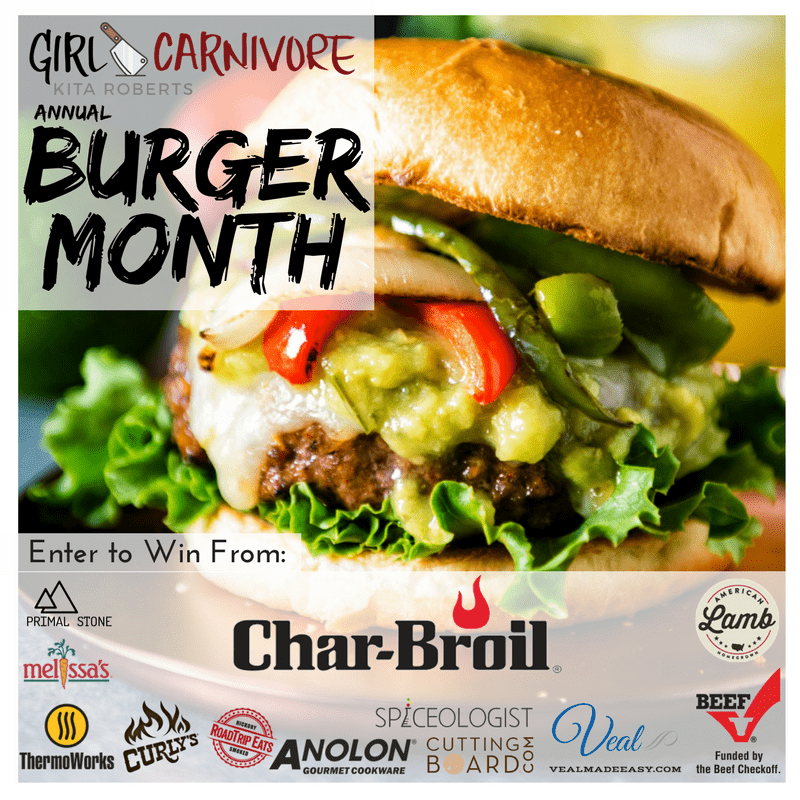 Visit burgermonth.com to enter to win a grilling prize package worth over $800 and learn more about our sponsors, American Lamb Board, Anolon. Beef, It’s What’s For Dinner, Char-Broil, Curly’s BBQ, Cuttingboard.com, Melissa’s Produce, Primal Stone, Spiceologist , Thermoworks , & Veal Made Easy. Will substituting with ground chicken make a difference in the texture or taste? I have some already in the freezer and thought I’d use it up. The flavor of the meat might be a little more delicate, but other than that it should still be tasty!